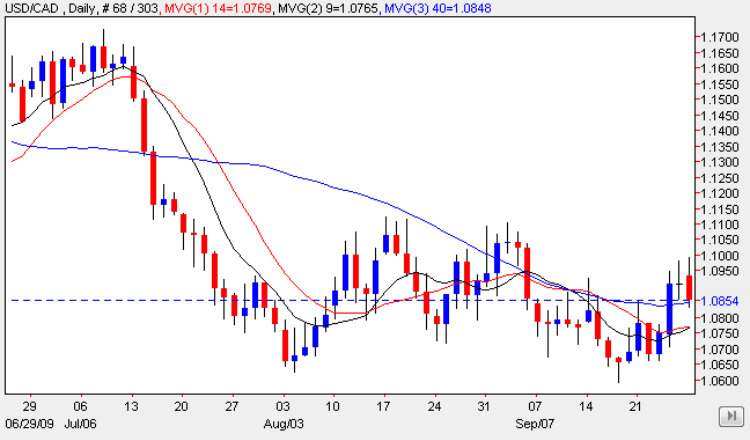 As suggested in Friday’s market analysis for the usd to cad pair, the doji candle of Friday seemed to suggest that we were due for a reversal lower, which duly arrived in yesterday’s trading session, with the pair closing the day lower, and with a deep upper wick to the candle top. This is itself is certainly a bearish signal and confirms once again that the pair are struggling at this level, and we should see move lower in the short term, particularly the as the resistance immediately ahead in the 1.10 region seems to be holding firm and presenting a significant barrier to any attempt to move higher. Indeed yesterday’s price action has also left us with an interim tweezer top which again suggests a move lower should be expected in due course. The only counter argument to this would be the support which the pair found from the 9 day moving average in yesterday’s trading session, indicating a degree of bullish sentiment in the market. However, once this is breached, then we should see a move lower to re-test the 1.065 usd to cad price level once again. With no fundamental news on the economic calendar for the usd to cad to day, the only item of news for the currency pair is in the US, with the release of the CB Consumer Confidence data later in the trading session, with a forecast of 57 against a previous of 54.1 last time.